Transform your photos and videos into stunning movies. 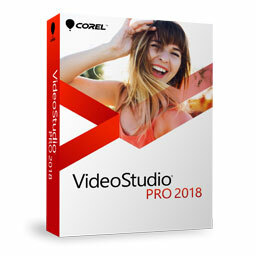 Corel VideoStudio Pro 2018 expands its award-winning combination of ease of use and breakthrough creativity that makes video editing fun and easy. Tap into hundreds of creative effects, templates, and titles and impress yourself with what you can create. Crop, resize, and position your media quickly with new tools that make editing videos even easier. Loaded with fun new features, show multiple videos simultaneously, create elegant titles, and zoom into the action with new controls. Enjoy tools like screen recording, multi-camera editing, 360 video editing, and more with the complete video editing suite. Turn your memories into movies you’ll cherish with VideoStudio Pro 2018. Dive into hands-on, creative video editing with VideoStudio Ultimate 2018. Now VideoStudio takes its award-winning combination of ease of use and breakthrough creativity and adds new Split Screen video, titling tools, and controls to make quick edits and custom motions. Tap into more than 2,000 fun and sophisticated effects, elegant titles, and premium plugins in the Ultimate Effects Collection. Play with speed, stabilize video, edit 360 videos, and tell your story from up to six angles—even remove lens distortion with new correction tools! For your best movies, and the best value, VideoStudio Ultimate is the only choice.